The tympanic membrane (ear drum) provides protection to the middle ear structures, and is part of the amplification system of the ear. Therefore a hole in this membrane increases the risk of infections as well as to cause degrees of hearing loss. A perforation can be the result of trauma, or of acute and chronic infections. The initial assessment requires microscopic examination, a formal hearing test, and often a CT scan of the ear, to exclude more serious conditions. In general terms surgical closure of the hole is recommended, with the size and chronicity important factors dictating the complexity of the repair. Occasionally if the degree of hearing loss is only mild, and the ear is able to be kept completely dry, observation is recommended. 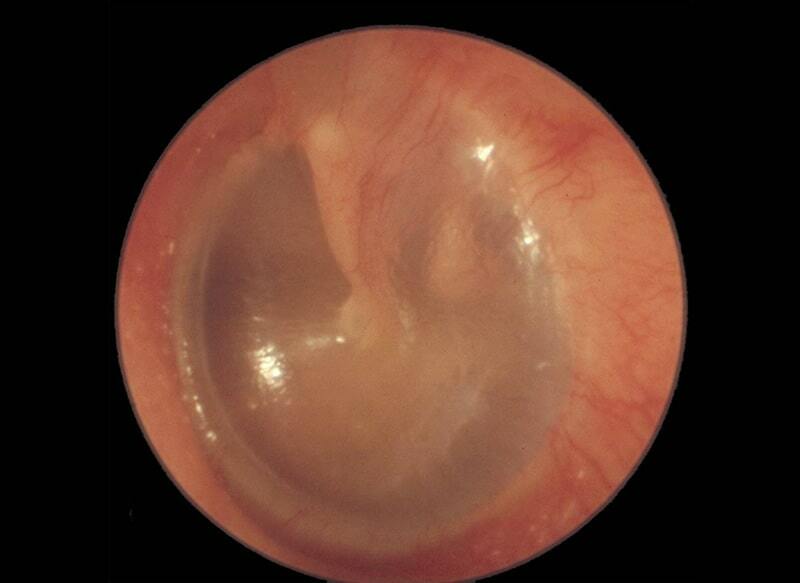 A picture of a normal tympanic membrane. 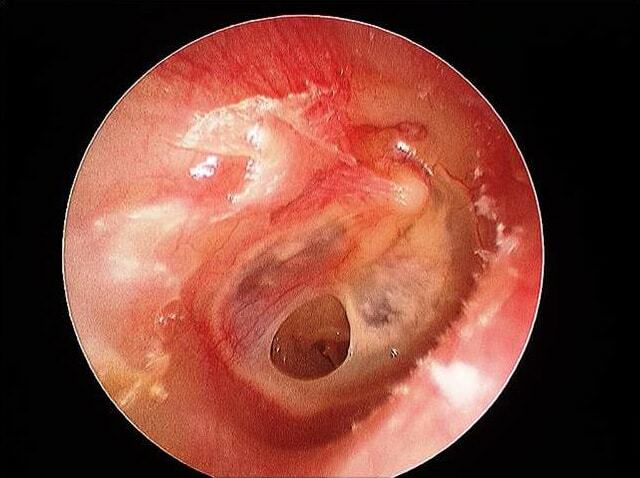 Small perforation in the tympanic membrane. There is evidence of co-existing infection. This perforation occurred following a fall from a surfboard onto the water. Similar injuries can occur after a blow the external ear due to a pressure wave created down the ear canal. If the infection can be cleared, most of these perforations heal spontaneously. 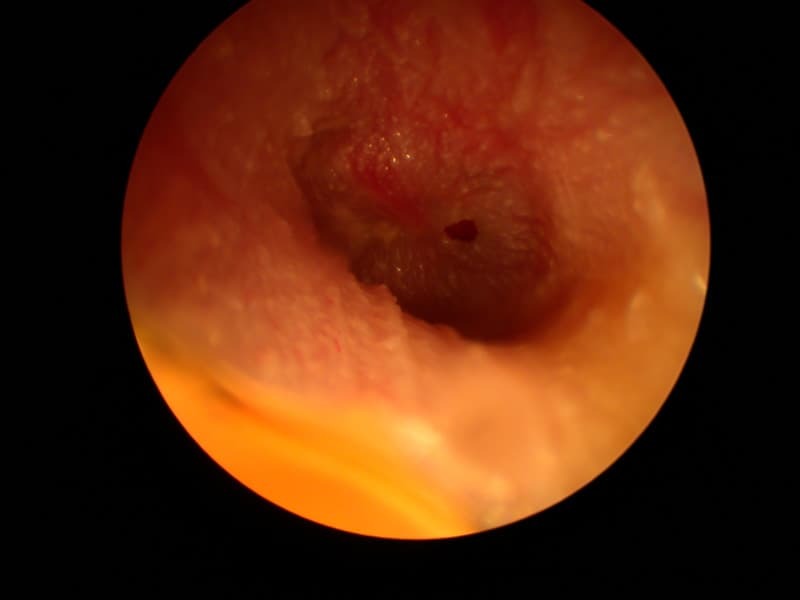 A small tympanic membrane perforation. This is of long standing, thus with no chance of spontaneous closure. In general terms, the larger the perforation the worse the hearing. 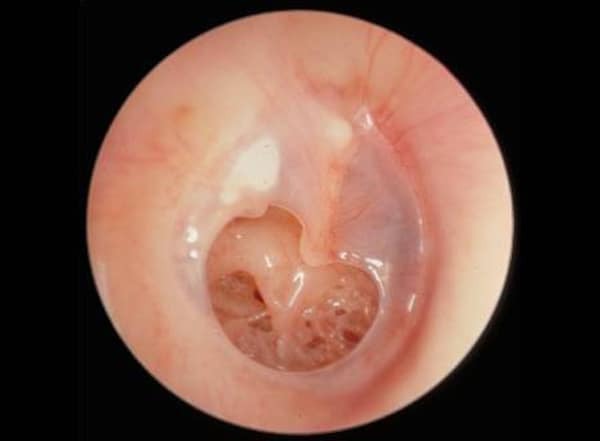 A larger perforation of the ear drum. Currently there is no infection, but is associated with a significant conductive hearing loss.